With Halloween quickly creeping up on us, I'm sending out my round-up of "Joyful Reads & Finds" a couple of days before the weekend. That should give you plenty of time to get ghoulish (and greener) for your Halloween festivities! To be honest, I was never much of a "Halloween person" -- all of that pesky begging for candy, and toilet tissue in trees, made me into an October version of the Grinch. So why the change of heart? Well, it's pretty easy to get in the holiday spirit once your kids reach a certain age (somewhere above two and under twelve) and want to wear their Halloween costumes from early September through (oh, let me see...) late March? Anyway, some Halloween treats for you--enjoy! Maybe these 2 Ingredient Beauty Recipes will help you remove all of that ghoulish makeup? I love this "Family of S'mores" costume! Happy Halloween, friends--I hope it's a hoot! When I was in my early 20's (sheesh, back in the Stone Age! ), I was on vacation in Antwerp (a lovely Old World city), and my Belgian boyfriend introduced me to Nutella. I could be mistaken, but I think I heard a choir of angels singing--the taste was beyond heavenly. A chocolate-hazelnut spread! On toast, topped with fresh fruit! That was my version of ambrosia, the food of the gods. So, why did I give up something that I LOVE to eat? Because I found out that Nutella--along with the generic supermarket versions of it and the knock-offs from Jif and Hershey--is made using palm oil. And palm oil is a deal-breaker for me. According to the World Wildlife Fund, an area the equivalent size of 300 football fields of rainforest is cleared (burned) each hour to make way for palm oil production. Rainforest animals "get in the way" of the palm oil industry, and animal cruelty and killing is rampant. Many species are being pushed to the brink of extinction, including Orangutans and Sumatran tigers. If you have a strong stomach (warning: graphic photos), this link explains the everyday tragedies caused by the sourcing of palm oil. The extent of the problem is HUGE, because palm oil is used in...oh, let's see...almost everything?! Here's a list from the World Wildlife Fund to illustrate that point. Check those ingredient labels! Believe it or not, there's something good to report: Six months ago, Ferrero, the makers of Nutella, switched over to 100% sustainable palm oil. Hopefully, they'll update their label with that fact, and soon. But not all companies use sustainable palm oil, so if the label doesn't say it, check the product website or call them to ask. FYI: There are several all-natural or organic chocolate hazelnut spreads made without palm oil. Check out this list called "Move Over, Nutella! We've already tried two of them at our house: Justin's Chocolate Hazelnut Butter (too salty for me, but the kids liked it), and Nocciolata Organic Hazelnut Spread (that one's a winner!). Tonight, feeling nostalgic for my Nutella days, I melted down some semi-sweet chocolate chips, mixed in some toasted almonds (no hazelnuts in the pantry! ), and added a pinch of sea salt. It's pictured at the top, with sliced apples. Didn't taste a thing like Nutella, but I think I heard two angels singing. Or maybe that was just my kids...they loved it. How 'bout you? Have you ever given up a product for ethical reasons? Do tell in the comment section below! My Week in 5 Photos: Practically a Zoo! This week's photos, just by happy coincidence, are all animal-related--even if they're not all photographs of actual animals. For example, the plant above is called "Hens and Chicks." I love Hens and Chicks! I would've bought two or three of these plants today, but the snooty florist had a bee in her bonnet. Bad service = no sale! The little guy below was very attentive, though. We met him at a local farm. I think he was hoping that I was packing a few carrots in my purse. Goats have such interesting eyes, don't they? For the last couple of years, my children have been collecting donations for the animal rescue organization that saved our wonderful dog, in lieu of birthday presents from their friends. (Yes, I am a proud mom!) My daughter is pictured below, delivering some of the bags of dog food that were almost as big as she is! We ended the week with monkeys! Dropping off kids' outgrown clothes and shopping for "new" camp clothes at Little Monkeys consignment shop. I love consignment shops! They're one of the greenest things around. If you haven't ever visited a consignment shop, look them up in your area and give 'em a try! Hens, chicks, goats, dogs, cats, and monkeys...yep, I guess you could say it was one wild week! Join me in July for my 12-day photography e-course, "How to Take Better Photos of Nature and the World Around You." All digital cameras welcome (any type, including smart phones). Even if you have a full-time job, you'll be able to take this online course at your own pace. Less than $10 per lesson--treat yourself today! Click here for all the course details! 1. Search Google for "images of African women carrying water" or just click on this article. While we can turn on the tap mindlessly, it's pretty sobering to realize that over one billion people in the world lack access to fresh water. Many of them struggle every single day to find clean water, or carry that water for miles in heavy jugs, or carefully ration its use until the next rare rainfall. Show the images to your children and discuss the very real value of water in the world. 2. When you boil water for pasta, put frozen vegetables in the colander. When you drain the pasta, pour it right over the frozen veggies, toss the pasta and veggies together, add a simple sauce and seasoning, and voila! Dinner is served. 3. Keep a watering can (or two) on your deck. After it rains, use the rainwater to feed your plants and flowers. 4. Put a clock in your bathroom to keep track of how long you're showering--preferably, a clock with an annoying alarm so you'll become more efficient with your rinsing time to avoid the horrid noise. 5. Add ice cubes to your pets' water bowls to keep their water fresher and cooler for longer. 6. Keep a large pot or basin in your kitchen sink with dish soap in it. Angle the faucet right above the pot so that any tap water used during the day goes into the basin. After meals, put your dishes and utensils to soak in the soapy mixture. They'll be all set for the dishwater later, without extra scrubbing. 7. When you boil water for tea, use the excess water for steaming and disinfecting your sink and sponges. 8. Curb mindless hand-washing. Have your kids aim for singing "Happy Birthday" twice while washing their hands with soap. When they're done, off goes the tap! 9. Invest in a rain barrel with a hose attachment for watering your lawn and garden. Yes, they can get pricey, but you'll save on your water bill. 10. Have a rain sensor installed on your lawn sprinkling system. How many times have you driven by a yard with a sprinkler system going off in a rainstorm? Don't let that next yard be yours! Your turn: How do you save water at your house? Let's hear it in the comment section! If you have a digital camera (any type, including a smart phone) but don't know how to really use it to its fullest creative potential, registration is now OPEN for my July photography e-course, "How to Take Better Photos of Nature and the World Around You." Even if you have a full-time job, you'll be able to take this online class at your own pace. Click here for details! About a year ago, I was uncharacteristically early for an appointment (I'm sure my friends are nodding all-too-knowingly at that statement! ), so after I arrived in the parking lot, I turned off the engine and took out a book. But then I happened to gaze up and saw the tree pictured above. Stately and serene, standing tall at the end of a wild and pretty meadow. Not your usual view from a dentist's office, right? Instead of reading my book, I got out of the car and took several photographs of that particular tree and that particular meadow, along with other equally striking trees framing the natural space. I loved the way that the trees and the meadow combined to form a perfect union. One part of the other, and both part of the whole. It was one of those happy coincidences that I was there to appreciate them. And it's particularly fortunate that I captured all of my "Tree-Meadow Portraits" when I did, because when I returned to the dentist's office last week, the meadow was no more. In its place were diggers and dumptrucks. Piles of dirt and concrete blocks. The line of trees was still there, thankfully. But the trees somehow looked forlorn next to the buzzing construction site. And frankly, I was really sad that yet another natural place had been scraped out, chopped down, stripped bare, and prepped for commercial ventures. Probably for another nail salon or burger joint. Why do we have this insatiable need to eradicate the natural in favor of the commercial? To put money above all other things that have value? In our town right now, we already have far too many commercial properties that have been vacant for the past few years. We have construction sites that have been stalled in their tracks because not enough buyers were willing to put up the money to complete the jobs, after the woods had been clear-cut to make room for...oh, nothing in particular. I thought of all the little things I didn't see in the meadow when I took these pictures. The birds that were filling the air with their songs. Some field mice, most likely. Dragonflies and butterflies. Plenty of wildflowers that I didn't get close enough to really examine. Probably a few rabbits. Unseen little creatures who had called this meadow "Home." I thought about how Beatrix Potter used a large portion of the money she earned from her Peter Rabbit tales to purchase thousands of acres of undeveloped countryside in England, just so she could donate it all to the National Trust and safeguard its future. As soon as I got home, I searched for these photographs of the meadow, just to prove to myself that it really had been there...once. 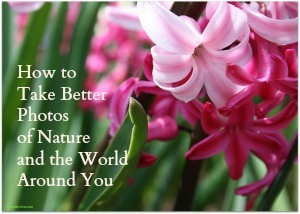 If you have a digital camera (any type, including a smart phone) but don't know how to really use it to its fullest artistic potential, registration is now OPEN for my July e-course, "How to Take Better Photos of Nature and the World Around You." Click here for details and join me online in July! There's a scene in an old episode of "Mad Men" in which Don and Betty Draper are having a picnic in the park with their children--enjoying the outdoors, the gentle breeze ruffling their hair, the kids running around in a game of tag. A "typical" family (well, a very good-looking version of a typical family! ), spending an afternoon on the outskirts of suburbia. And then, Don glances at his wristwatch and they sigh: It's time to go home. So, Betty shakes out the picnic blanket, sending all of their food scraps and garbage flying out onto the grass, and carefully folds up their blanket in her fashionable tote, while Don crumples up his beer can and pitches it into the woods. The scene had a certain shock value to it, this blatant and thoughtless littering waaaaaaay back in the 1960's, because we all know that nobody litters anymore--we're all too enlightened now. Right...? So, what's the essential thing to bring with you when you're photographing nature? It's an extra bag, to pick up after the modern-day Drapers. Tags: Don and Betty Draper, empty water bottle, feel sorry for wildlife, Mad Men, photographing nature, plastic bag, reasons for littering, why do people litter?